The Langtang valley is one of the more obscure trekking destinations of Nepal. It is not immediately on the list of prominent trekking destinations like the Everest or the Annapurna regions. But that is precisely why the Langtang valley makes for the best off-the-beaten-path treks. As such, the Langtang Gosainkunda Sundarijal Trekking is perfect for trekkers who are looking to explore the hidden gems of northern Nepal. Throughout the journey, trekkers are presented with amazing natural surroundings, magnificent Himalayan peaks, gorgeous valleys, a diverse ecosystem, and rich ethnic cultures. The adventure begins with a drive from the capital to the settlement of Sybrubensi. From there, the trekkers walk on verdant woodlands and through the Langtang valley, passing by many ethnic Tamang settlements and villages like the Langtang village, Bamboo and Tharepati among many others. 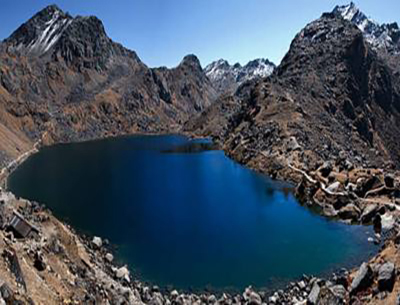 The journey includes many amazing highlights and features of the valley, like the holy Gosainkunda Lake as well as spiritual monasteries of Tamang heritage like the Kyanjin Gumba and the Shin Gumba. Moreover, the journey also includes visiting the vantage points of Chisapani and Sundarijal from where the views of the Himalayan peaks are utterly splendid. 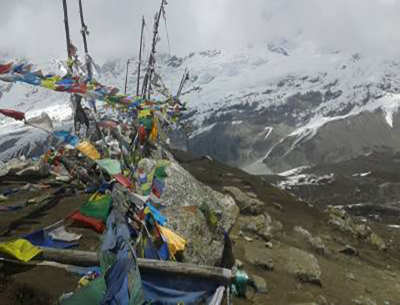 The Langtang Gosainkunda Sundarijal Trekking is a journey that perfectly encapsulates the Tamang tenor of the region while at the same time presenting trekkers with unprecedented natural beauty. Similarly, trekkers will be going through the Langtang National Park and can enjoy the opulent woodlands and alpine acreages of the valley where endangered species of animals like the Red Panda and the Musk Deer have their habitat. The rhododendron-covered terrain makes for a beautiful contrast against the cerulean Langtang peaks. The Langtang Gosainkunda Sundarijal Trek is a moderate trekking journey that does not require any previous trekking experience to do. It is best suited to be done during the spring and autumn seasons. Destination Unlimited is one of the leading agencies in the front of travel and tourism in Nepal. Our well-rounded and carefully-crafted package of the Langtang Gosainkunda Sundarijal Trekking is the best trip that presents our customers with an unforgettable experience. With us, you are guaranteed the best services at all times. When you arrive in Kathmandu, you will be transferred to your Hotel by one of our staff who will be waiting for you at the airport. There is nothing else planned for today, so you can relax at the Hotel. Overnight stay at the Hotel. Day 02: Drive From Kathmandu to Sybrubensi | 1503m| 7Hrs. Today, you will have a drive from Kathmandu to the booming settlement of Sybrubensi. It is a 7-hour ride through the countryside of Nepal where you can enjoy the glimpses of the villages as they pass. Vast open fields of mustard and barely cover the land and roaring hills covered in woods also decorate the terrain. Overnight stay at the guesthouse. Day 03: Trek from Sybrubensi to Lama Hotel |2410m| 5-6 Hrs. You will be making your way to the popular stop called the Lama Hotel today, trekking alongside the beautiful Bhote Koshi River. Further on along the woodlands, the river joins with the Langtang Khola. Trekking upwards from the river, you will reach the settlement of Bamboo. The path then ascends gently downwards towards Ramche and then to the Lama Hotel. Overnight at guesthouse. Day 04: Trek from Lama Hotel to Langtang Village |3430m| 5-6 Hrs. From the Lama Hotel, you will make your way through thick woodlands of alpine trees towards Langtang Village. Trekking onwards from here, the trail opens out into an emerald Himalayan pastureland. The Langtang village lies ahead; you will reach it once the pastureland is crossed. From the Langtang Village, magnificent views of peaks like the Shringi Himal (7161m) the Langtang Himal (7227m), Langtang II (6596m) and the Ganesh Peak (7422m) among others are seen quite majestically. Overnight at guesthouse. Day 05: Trek from Langtang valley to Kyanjin Gumba |3830m| 5-6 Hrs. The Kyanjin Gumba is one of the oldest Buddhist monasteries of the Langtang valley. It has beautiful Buddhist murals and paintings that depict demons and gods from various legends. After exploring the Gumba, you will hike up to the vantage point of the Tserko Ri (4984m). The viewpoint offers dramatic views of Langtang Dorje Lakpa (6,996 m), Langshisa Ri (6,810 m), Lirung (7,227m) and Gangchempo (6,888 m). After spending time Tserko Ri, you will return to the Kyanjin Gumba. Overnight at guesthouse. Day 07: Trek from Kyanjin Gumba to Ghodatabela |3020m| 5-6 Hrs. From Kyanjin Gumba, you will be walking through the verdant woods again to Ghodatabela. The village is situated amongst tall cliffs and has a very serene atmosphere. Along the journey, you can spot pheasants in the woods and if you are lucky, come across deer clearing as well where the Musk Deep graze. Overnight stay at the guesthouse. Day 08: Trek from Ghodatabela to Bamboo |1970m|5-6 Hrs. From Ghodatabela, you will be tracing your steps once again alongside the Bhote Koshi River and pass the Lama Hotel towards Bamboo. 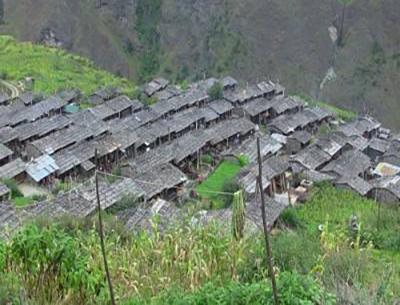 The journey ahead takes you along the Langtang River and mostly takes you through Tamang settlements. You will move on a trail that runs through rhododendron and oak forests to reach Bamboo. Overnight stay at the guesthouse. Day 09: Trek from Bomboo to Thulo Syabru |2210m|5-6 Hrs. Gradually climbing up through the terrain, you can see the gaping valley open out into the canyon below and the gush of the Bhote Koshi as it flows past, meandering its way to join the bigger river of Koshi ahead. The terrain is quite beguiling with blooming rhododendron trees and scented maples covered in rain moss. Eventually, you will reach Thulo Syabru. Overnight stay at the guesthouse. Day 10: Trek from Thulo Syabru to Shin Gumba |3330m|5-6 Hrs. Making your way through the woodlands, you will be trekking to the Shin Gumba today. Aside from the famous Cheese Factory of Langtang, the Shin Gumba and the village that it is situated in is also known for its cheese made from the milk of the herded yaks. The settlements in this area still have great influence of Tibetan culture in their lifestyle. Overnight stay at the guesthouse. Day 11: Trek from Shin Gumba to Gosainkunda Lake |3480m|5-6 Hrs. Entering the Gosainkunda basin, you will be making your way towards one of the highlights of the trek- the Gosainkunda Lake. There are many lakes in the basin, but the main lakes are three- the Bhairav Kunda, the Saraswati Kunda and the Gosainkunda itself. The sapphire lakes are quite beautiful and the terrain, on which they lie, covered in snow, makes for a superb experience. Overnight stay at the guesthouse. Day 12: Trek from Gosainkunda Lake to Thadepati |3690m|5-6 Hrs. After enjoying the sight of the Gosainkunda lakes and of the towering Himalayan peaks, you will gradually descend downwards through gentle wooded slopes to Thadepati- a rich Tamang settlement where you can buy handicrafts from the locals. You will also pass villages like Phedi and Ghopte to make way to reach Thadepati. Overnight stay at the guesthouse. Day 13: Trek from Tharepati to Kutumsang |2470m|5-6 Hrs. From Tharepati, you will take a pleasant walk through small streams and rolling hills, passing pine and rhododendron forests. From here, you will merge with the famous Helambu trail. Passing the settlement of Mangengoth, you will reach Kutumsang. Overnight stay in a guesthouse. Day 14: Trek from Kutumsang to Chisapani |2215m|5-6 Hrs. Ascending to a ridge, you will reach Mangengoth. You begin to trek down to Gull Bhanjyang. From here, you will then climb to Thodung and descend to Cipling. Descending to Thankune Bhanjyang, it is an easy walk to Pati Bhanjyang. A steep drop from here will take you to Chisapani. Overnight stay in a guesthouse. Day 15: Trek from Chisapani to Sundarijal |1410m| and Drive back to Kathmandu.|45 mins. It is a four-hour hike from Chisapani to Sundarijal- a beautiful viewpoint from where the sights of the peaks are quite amazing. You will be trekking through the Shivapuri National Park, walking through forested areas to Borlang Bhanjyang from where you will trek down to Mulkharka. Further from here is Sundarijal. After taking in the views of the peaks at Sundarijal, you will drive back to Kathmandu. Overnight stay at the Hotel. Today, you can spend the day as you please. You can do souvenir shopping at Thamel- the tourist hub of the Kathmandu city or can enjoy different cuisines at the many restaurants and diners across Kathmandu. You can also explore the remaining world heritage sites in the valley. Overnight stay at the Hotel. Approximately three hours before your scheduled flight, you will be dropped off at the airport for your final departure. Sleeping bags( End of Trekking need to return) Duffel Bag for carrying.